On An Overgrown Path: Does Facebook really have to be this dire? Does Facebook really have to be this dire? Social media and its inherent dangers are forensically analysed by Jacob Silverman in Terms of Service. This book should be required reading for all social media users; even for those who already understand how Facebook manipulates news feed and sells their personal data to all and sundry to boost its $523 million profit. It makes for very frightening reading, but the fact remains that there are 1.5 billion Facebook users. Which means social media offers a powerful free (if the cost of losing control of personal data is ignored) communication platform for classical music, an artform that is struggling to widen its reach. So why is classical music's use of Facebook and other social media so dire? Classical music's Facebook users fall into two categories: those who need to sell themselves and those who don't. Those who don't need to sell themselves conform to the social media convention of circulating stories from the Guardian, BBC and New York Times that everyone has already read, supplemented by photos of their dinner and videos of the cat; while those who do need to sell themselves follow the convention of the hard sell. Let me give one example of that hard sell: John Luther Adams is a composer and visionary who I have great respect for, and I have shared that respect with readers. Because I admire his work, Facebook updates from JLA are - or rather were - among the few I read regularly. But the updates have become a non-stop torrent of publicity for performances of his music interspersed with relentlessly positive reviews; in fact the sell is so remorseless that I will give JLA the benefit of the doubt and suggest that his Facebook account is controlled by an intern at his publisher. However, who writes the updates is not important; what is important is that social media has become commercial media, and in that transition something important has been lost. It is unfair to single out just one fine musician for the sin of using social media for self-promotion, because so many are doing it; with Joyce DiDonato's Twitter feed being one of the most blatant examples. Presumably the intention is that these promotional blitzkreigs should impress. But, speaking for a sample of one, it has the opposite effect on me - I have simply stopped reading them. Blogs were one of the earliest forms of social media, and the blogosphere was for a short while an idealistic community of ideas. But that was a decade ago, and one of the tragedies of the digital age is that both in the arts and elsewhere, the strong have become stronger, and the weak have become weaker. At a time when classical music struggles both to retain its established audience and to engage with new audiences, a community of ideas would be of immense value. We need to widen artistic horizons; not narrow them by handing social media platforms over to the strong who do not need the exposure. But where on Facebook and Twitter is the coverage from the edge of the network? Where is the excitement about new discoveries? Where is the counterbalance to the hegemony of the corporate music machine? Where is anything being pursued other than 'likes' and 'retweets'? Where is the infallibility of new technology being questioned? Where is the collegiality by which the strong helped the weak grow stronger in the early days. Where are the alternative views? Where is there anything other than self-interest? Where has all the idealism gone? In 2007 Jonathan Harvey sent me an email in response to my early advocacy of his music on this blog, saying: "I was delighted to find such a passionate advocate of my and other contemporary music forging his own path (not so overgrown!) clearly in opposition to most current trends. I've always felt that it is and will be strong enthusiasm that will change the world!" Call me a hopeless idealist, but I still believe that strong enthusiasm is more powerful than self-promotion. So let me counter the seemingly pessimistic tone of this post by sharing my enthusiasm for some music that has been lamentably ignored on social media..
John Luther Adams was a friend and admirer of the composer Lou Harrison, and he has expressed that admiration in his composition 'For Lou Harrison'. Lou Harrison is celebrated for his syncretic music, and a number of his works reference Indian styles. Six of these have been transcribed by Barry Phillips as the suite 'Jahla Journey' and recorded by the West Coast based Lux Musica Ensemble. These transcriptions are more than opportunism, because Ravi Shankar knew Lou Harrison when they both lived in California. 'Jahla Journey' is on the CD 'Raga & Raj' released on East Meets West Music, the record label of the Ravi Shankar Foundation. As a cellist Barry Phillips has toured with the Anoushka Shankar Project, and on the CD are 'Eight Ragas' composed by him and played by Lux Musica. Barry Phillips had a long association with Ravi Shankar which dated from the George Harrison produced 'Chants of India' released in 1997, and the 'Eight Raga's are very much in the mould of the George Harrison produced 'Shankar Family & Friends' album which dates from the same period. Also on 'Raga & Raj' are transcriptions of four of William Hamilton Bird's 1789 'Hindoostanee Airs'. (These curiosities were written for harpsichord, and a recent CD on Signum of all the Airs far outstays its welcome despite the determined advocacy of the hugely talented Jane Chapman). 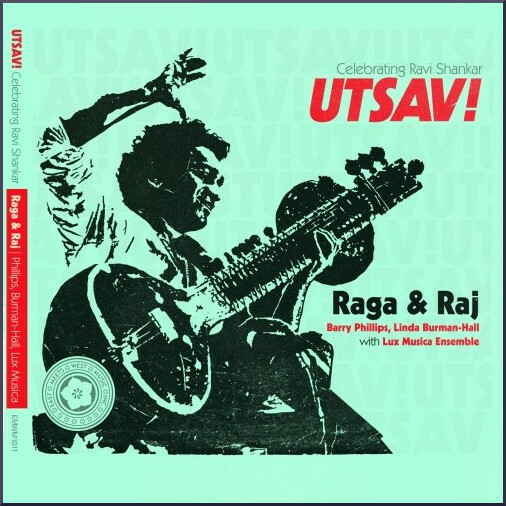 Concluding 'Raga & Raj' is a moving instrumental transcription by Barry Phillips of the Hindu Bhajan (devotional song) Raghupati Raghava Raja Ram. Given the celebrity that Ravi Shankar achieved in both the East and West, it is puzzling that the work of East Meets West Music is so far off the social media radar. The label's crowning achievement to date has been the release of Ravi Shankar: The Living Room Sessions, Parts 1 and 2. These Living Room Sessions capture exquisite valedictory performances by the 91 year old sitar master at his home in Encinitas, California; their producer was Barry Phillips, with the first album quite rightly winning a Grammy in 2013, and the second earning a Grammy nomination a year later. But also noteworthy is Ashwini Bhide Deshpande's recording of six vocal ragas by Ravi Shankar on a CD titled 'Arghyam: The Offering'. 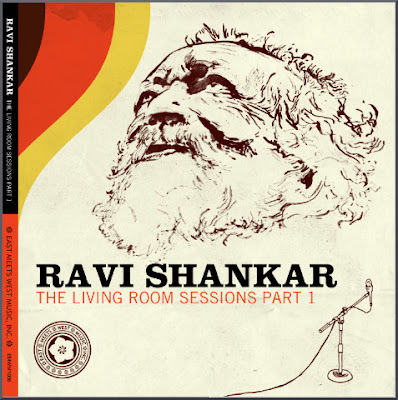 Although Ravi Shankar converted the West to Indian instrumental music, he did not manage to do the same for the higher art of Indian vocal music. However, the vocal tradition had a significant impact on contemporary Western music as it influenced the minimalist pioneers La Monte Young and Terry Riley. All the releases from East Meets West Music deserve to reach a wide audience. If this post brings a new discovery to just one reader it will have done its job. And if John Luther Adams does not 'unfriend' me, that will be even better. No review samples were used in this post. Header graphic comes from Facebook page of 'Classical Music Humor'. No specific criticism is intended of this Facebook page, it simply provides a relevant graphic. Any copyrighted material on these pages is included as "fair use", for the purpose of study, review or critical analysis only, and will be removed at the request of copyright owner(s). Also on Facebook and Twitter. I don't think it's fair to blame Facebook for JLA's social media posting habits. If you don't like the posts, unfollow. I subscribe to your blog via RSS because I like what you write. If that changes, I'll unsubscribe. It's not complicated, but it does require the content consumer to take more responsibility than in an age of more centralized media control. Sorry if I didn't make myself clear Dave. I was not blaming Facebook: in fact I make the point that "social media offers a powerful free (if the cost of losing control of personal data is ignored) communication platform for classical music". The point I was hoping to make is that, given the potential of social media, it is a shame that its use is being limited to obsessive self-promotion. Yes, I and others, can stop reading JLA's updates - as I say in the post I no longer read them. That is me as a content consumer exercising responsibility. But it is also, in my view, a lost opportunity. My comment will not be popular, the truth seldom is. We live in a "consumer society" and identify ourselves as "consumers" This means a persons status is determined by what they consume not by what they produce. Pacivity is highly valued in a consumer society. What ever the consensus among consumers says is important is what is considered important, there is competition to consume the right items. In a consumer society advertisement embodies consensus, it is the same as scripture to consumers. This means that the more prevalent the advertisement the more desirable that which is advertised while the less prevalent the advertisement the less desirable that which is advertised. were we living in a "producer society" we would identify ourselves as "producers" A persons status would be determined by what they produce. Creativity is highly valued in a producer society. What ever is original among producers is considered important, there is cooperation to produce the right items. In a producer society novelty embodies originality, it is the same as discovery to producers. This means that the more unique the discovery the more that which is discovered is desirable while the less unique the discovery the less that which is discovered is desirable. In a consumer culture the more creative original and unique an item is the less desirable it is and the less status it and its producer receives. In a consumer culture the more money you make and the more famous you are the greater the status regardless of how you made the money or for what reason you are famous. A consumer societies first priority is to suppress cancel and destroy any sign of creativity with the media school system and work place all designed with meticulous precision to achieve this end. Because creativity is occasionally required because of the inevitable competition which rules a consumer society every effort is made to contain it within strict limits and bounds so as to minimize its disruptive potential, inventors are made to sign contracts that relinquish all control over ALL of their ideas company related or not, if this were physical labor it would be identified for what it is, slavery. A sieve is set in place to ensure that the entertainers and artists that conform to the agenda receive ample promotion and those who do not are never seen.